"Nathaniel Keene was dead to the world." It's a striking first line, and it sets the confident, sometimes snarky tone from author Aditi Ramaswamy. You see, poor old Nathaniel is about to become a vampire. Worse, a vampire facing the horrors of... high school. 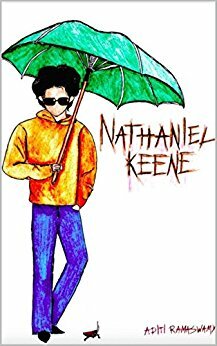 Told with zip and zest, we follow the outsider Nathaniel, now forced to hide behind sunglasses and a deeply unfashionable umbrella, as he discovers, against all his past experience, people he can call friends. With more than an occasional nod to the world of Buffy the Vampire Slayer, Nathaniel soon finds himself part of his own Scooby gang, adjusting to his bloodlust by swigging packets of pig blood provided by an unfazed school nurse. You see, there have been vampires in town before, and the town knows how to adapt. The school may know a little too well how to adapt, for before you know it, and barely by the time the bonds of friendship are forming, Nathaniel finds himself framed for the murder of his German literature teacher. He faces a trial, and at the same time has to figure out who the real killer is, unexpectedly assisted by a talking cockroach. Things get weird. In all of this, there's a good deal of fun - but there are a couple of big things that don't quite work out in the story. The villain - spoiler alert, there is a villain - has a habit of excess monologuing, while the trial itself alas seemed very fake, almost pantomime in its nature, and shook me out of the story. Ramaswamy writes with flair, but the back end of the story is a bit clunky, and with too many characters explaining what was going on all along. There's fun to be had along the way, though, and Nathaniel is a fun character to hang out with, unfashionable umbrella or not.